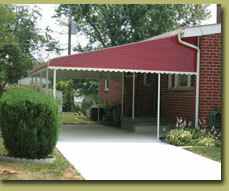 Aluminum Awnings are essential to home design and protection. These quality awnings will not only protect your home from direct sunlight but also it offers great style and functionality benefits as well. – Aluminum Awnings have insulated layers. This is beneficial to your home because insulated layers absorb heat to help you stay cool underneath the awning. – Aluminum Awnings are very durable. These awnings do not tear when strong winds hit them. Instead, they stay in place because of their aluminum sheets are screwed on beams and braces no matter what the weather has in store. – Aluminum awnings are low maintenance. When it rains, water droplets remain on fabric awnings but with aluminum awnings the rain will easily drain off it and make cleaning your awnings an easy task. – Aluminum act like extension of your roof. This is a detachable awning. It can be installed with a variety of attachments and accessories to help with the functionality of your roof. You can even install ceiling fans or skylights with this awning for additional comfort and temperature regulation. Let Carroll Awning Company design and install unique, functional and stylish Aluminum Awnings for your home today. Check out samples of our Aluminum Awnings. Through our combined locations and experience, Carroll Awning Company provides innovative craftsmanship, superb service, competitive pricing and unfailing attention to details in order to deliver a product that exceeds expectations. A satisfied customer is always our first priority. We work with each of our customers to design an awning or canopy product that meets all the requirements of the situation. Thousands of projects and satisfied, repeat customers have taught us price is a primary concern but not the only concern. Therefore, quality and longevity of your awning are important factors in determining the true cost of the product. Material costs vary greatly and reflect the life expectancy and warrant they carry.